I haven’t made kanten since my last semi-disaster, but did learn two very important things about agar through my misstep, which are: a.) it must be boiled to be activated and b.) acidic agents, like those found in sour fruits, prevent agar from gelling properly. Armed with this knowledge, I attempted to make another kanten dessert this weekend that turned out to be a success. To reduce the amount of acid in the pomegranate, I rinsed and soaked the seeds in water first. Then, I created a subtly salted layer of coconut cream, and topped it off with a clear raw agave-sweetened base. A few pomegranate seeds were tossed in once the layers had slightly set, giving it a pop of color and an interesting textural contrast. This looked really pretty, tasted fresh and clean and was easy to make. Place the cold water into a glass measuring cup and microwave on high for 3 minutes. While the water is heating, place the coconut milk into a small saucepan over medium heat. Whisk until combined, then add in the agar and salt. Whisk until it starts to bubble. Remove the water from the microwave and whisk in the agar powder. Heat for another 30 seconds in the microwave, then remove and whisk in the agave. Set aside. Lightly grease the inside of a Tovolo tray with a little coconut oil. Wipe away any clumps or excess oil. Using a tablespoon, place one spoonful of the coconut milk into each compartment. Drizzle any leftover mixture into the compartments evenly. Place into the freezer for about 10 minutes to slightly set. Touch the tops of the coconut mixture gently with your fingertips. It should be slightly firm on the top, but soft underneath. If this texture is achieved, spoon the clear mixture into the compartments, leaving about a half an inch space at the top. 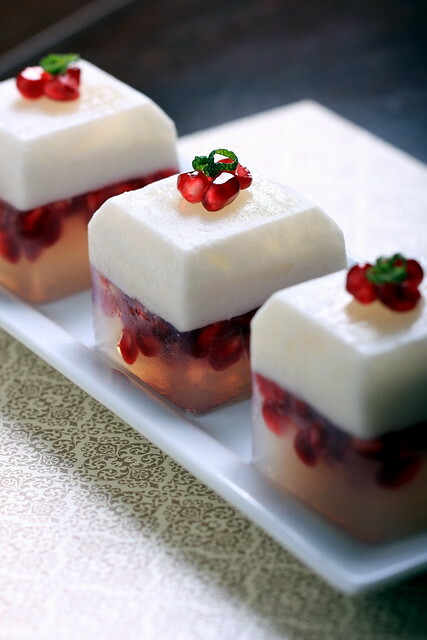 Let it lightly set in the freezer for about 5 minutes, then remove and distribute the pomegranate seeds evenly into the compartments. Place it back into the freezer for 15-20 minutes, then transfer to the refrigerator to set for an additional hour. To serve, place a plate, faceside down, over the top of the tray. Flip it over, then manipulate the tray slightly to release the cubes. Serve topped with some extra pomegranate seeds and lime zest. These are lovely and so festive looking. I have worked a little with agar but never got around to making kanten. I really want to try these! Thank you! Kanten is really fun to make, and the freezer helps make the two layers really adhere to each other. enjoy! these are so so so pretty! i will confess: slightly sweetened water? can you use something else, like coconut water or a clear juice? Thanks Lan! You can really use anything for the clear base — coconut water would actually be nice here! Clear juice would work too, as long as it is not acidic. It's beautiful. Can you use vodka with it to make "jello" shots? this is the coolest thing ever! you make amazing things! can you use brown rice syrup instead of agave? You can really add whatever flavor you want for the clear mixture, as long as it is not too acidic. enjoy! oh and I started following your blog; I really like your content! 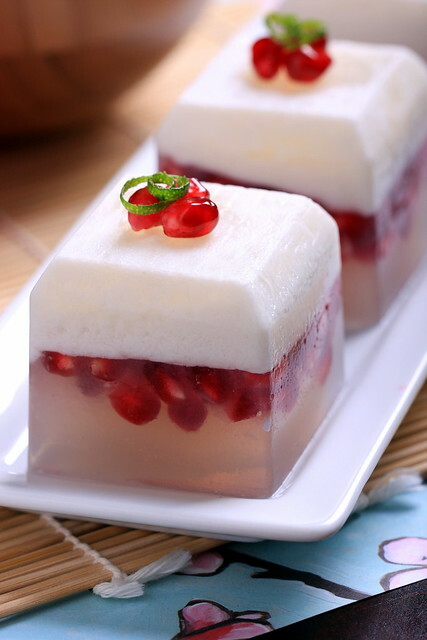 What a beautiful dessert and a great way to use pomegranate. It's funny, kanten means corners or edges in German and I think that fits very well for this. Thanks Mihl! I didn't know that, but you're right — it kind of works both ways here! wow Erin, what a stunning dessert:) I'm going to stay with my parents for Christmas, and think these would be a perfect dessert to take along, thank you! Thank you Christine! I didn't originally intend for these to look so Christmas-ey, but once we looked at the photos, I immediately thought: snow and hollyberries! I hope you and your family enjoy them! Looks wonderful! Does it make 6 servings?